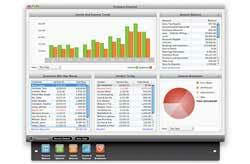 QuickBooks for Mac can easily organize your finances, identify ways to save money and manage your business better. Stay on top of it all with important information in one place. Create invoices, track payments and manage expenses. 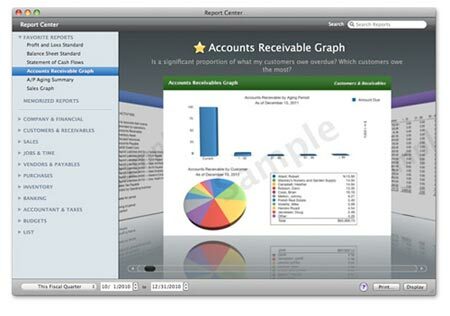 Get insight into your business with access to over 100 reports.Easily manage your business on a Mac. Let QuickBooks help your business be more profitable. Organize your finances, track money going in and out of your business, and spot areas where you can save. Stay on top of it all with important information all in one place. Prevent painful data loss by backing up your QuickBooks file to MobileMe. Choose one-time or ongoing automatic backup. You can restore it at any time. Never enter a phone number or address twice. Save typing time and errors by effortlessly synchronizing contact information between QuickBooks and your Mac Address Book, cell phone, PDA or other iSync-compatible applications. Activate QuickBooks Contact Sync, and selected contacts appear automatically in Address Book. Update a contact in Address Book…the changes automatically appear in QuickBooks. Leave the feature active to keep contact information, including email addresses, up-to-date at all times. QuickBooks integrates with iCal so you can be reminded to print invoices and checks or to pay bills in one consolidated calendar and never miss a bill payment. Simply check the box next to “Show in iCal” on any invoice and a reminder is added to your calendar. And if you later decide to change the payment terms on the invoice in QuickBooks, iCal is automatically updated with the new due date. Share your QuickBooks data with Windows-based users, such as your accountant. Send a Mac file to a Windows user (who can update it) and the Windows user can send it back. Just click the toolbar icon: “Backup to QuickBooks Windows”. As QuickBooks creates the backup, it simultaneously creates a PDF file of simple instructions for opening and sending back the file. Send both files to your accountant or Windows user. Easily print checks, pay bills & track expenses. Click to enlarge. Track sales, sales taxes & customer payments. Click to enlarge. Personalize forms, like estimates, invoices, and statements quickly and easily. Click to enlarge. Find what you need, when you need it with the Customer and Vendor Centers. Click to enlarge. Get a customized overview of your business with the Company Snapshot. Click to enlarge. Easily print checks, pay bills & track expenses. Aggregate all your checks to be paid and print them in one batch. QuickBooks will keep track of each check so you can keep tabs on where your money is going. Enter bills from vendors. Since QuickBooks organizes everything in one place, you’ll be able to access all past payments & bills for each vendor with just a few clicks. Receive payments from customers easily using integrated credit & debit card processing. 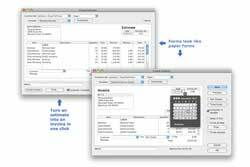 QuickBooks Payroll for Mac allows you to easily manage payroll online and export data into your QuickBooks software. Save time and work more efficiently when you e-mail forms to your customers and vendors. Make billing customers faster and easier when you track time and job costs. Personalize forms, like estimates, invoices, and statements quickly and easily. Add logos, images, and fonts to templates and create your own custom forms. Find what you need, when you need it with the Customer and Vendor Centers. 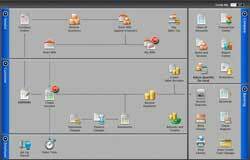 These Centers consolidate key information onto a single screen. The next time a customer calls with a question about his account, simply go to the Customer Center to see his contact information and complete transaction history. Customize the Company Snapshot to create a personalized overview of your business and see what’s most important to you. Get pre-designed, customizable business reports to gain insights into your business. See all available reports in one screen to easily choose the right one. Drill down with one click to see the detail behind the numbers. Export any report to Excel–your QuickBooks formatting and formulas go with it. QuickBooks helps you ensure you pay your bills on time. Record bills as they come and set a reminder to make sure you pay before the due date. All the tools you need. Click to enlarge. When it’s time to bill your customer, turn any estimate into an invoice with one click or create a new invoice using a familiar form. Click to enlarge. Accept credit and debit cards directly in QuickBooks. Click to enlarge. 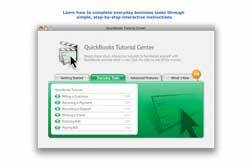 QuickBooks for Mac has a user interface designed to help you find what you need fast. Click to enlarge. Choose from over 40 icons to customize your toolbar for quick access to the tasks that you do most often. Click to enlarge. Save time completing everyday tasks like invoicing, bill tracking, check writing and payroll.13 Track sales and manage expenses. Quickly create estimates, invoices and purchase orders. Track inventory, employee time and job costs. Duplicate and edit previous estimates to create new ones without rewriting all the details. Use the date picker to quickly and easily enter dates into forms. Simply click in the date field and a pop-up calendar appears to help you select the right date. When it’s time to bill your customer, turn any estimate into an invoice with one click or create a new invoice using a familiar form. With Intuit Merchant Service for QuickBooks for Mac you can save money and time by processing card transactions directly through QuickBooks for Mac. There’s no additional software to purchase, phone line to add or terminal to buy. 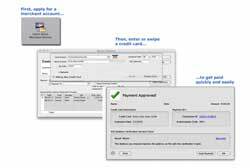 Just process the credit card and debit card transactions directly in QuickBooks for Mac and the data is automatically recorded in your QuickBooks software. Handle your end-to-end payroll needs, from paychecks to W-2, directly from QuickBooks–or any Web browser, anywhere with Intuit QuickBooks Payroll for Mac. No set-up fees, no minimum contracts and free support from payroll experts. Save time by tracking employee billable hours with My Time time-tracking software. 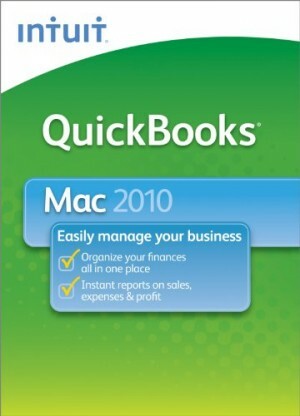 This free software is included with QuickBooks 2010 for Mac. 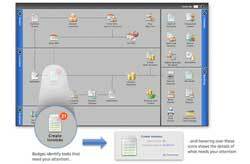 My Time helps you track billable time, instantly generate timesheets, and easily import timesheet data directly into QuickBooks 2010 for Mac to reduce data entry errors. Paying vendors is as simple as filing out familiar on-screen checks, printing them, and dropping them in the mail. Track inventory automatically as you log sales. When it’s time to reorder, create a purchase order with one click. Edit as needed and print. Or email the purchase order as a PDF file. Open up any record in the Customer or Vendor centers to access links to maps and directions to customer and vendor locations. 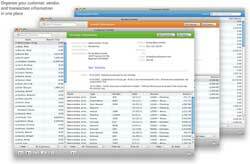 QuickBooks for Mac has a user interface designed to help you find what you need fast. The Home Page brings key tasks to one screen and uses arrows to show how they are interrelated, giving you one-click access to commonly-used tasks like creating estimates or invoices. Badges and placards, at a glance, identify select tasks that need your attention. For example, wondering if you have open invoices? Look for the red badge next to the invoice icon on the Home Page. It tells you how many invoices are open. Then simply move your mouse over the badge and a placard pops up showing you the total balance of those invoices with one click access to a report showing you the detail. Get an immediate view into your bottom line the way you want to see it. Customize the Company Snapshot to create a personalized overview of your business and see what’s most important to you. Choose the reports that are most crucial for your business including year-over-year expense and income comparisons, expense and income breakdowns, top customers by sales, and more. Find what you need, when you need it with the Customer, Vendor, and Transaction Centers. These Centers consolidate key information onto a single screen. The next time a customer calls with a question about his account, simply go to the Customer Center to see his contact information and complete transaction history. Access over 100 customizable reports in the Report Center and quickly see where you’re making and spending money. Scroll or search to find the report you need. The Report Center tracks your Favorites, manages your Memorized reports, and helps get you up and running with Suggested reports. Save time and avoid data entry errors. Instead of typing in your bank and credit card transactions download them from over 3000 participating financial institutions that support either Web Connect or Direct Connect, and easily import them into QuickBooks. Track payments easily by accepting one customer payment for open invoices across multiple jobs. Click a button to turn any invoice, estimate, purchase order, or report into a PDF file. Attach it to an e-mail and send it off right away, or group your mail-ready forms together and send everything off in one batch when it’s most convenient for you. Either way, you won’t have to wait for the post office to deliver. 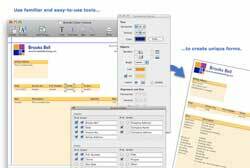 Personalize forms, like estimates, invoices, and statements quickly and easily with Layout Designer. Add logos, images, and fonts to create your own custom forms. 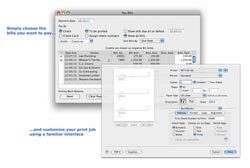 Built for the Mac, it uses familiar tools–including a formatting palette, drag-and-drop interface, and easy-to-use toolbar. Choose from over 40 icons to customize your toolbar for quick access to the tasks that you do most often. Resize and reposition the toolbar to fit with how you work. Use the Report Center to preview report templates and quickly find the report you need. Select a report to see a preview. Sort, reorder or hide columns. Set date ranges and filter as needed. QuickBooks for Mac Preferences now has a true Mac look and feel. Click to enlarge. Synchronize contacts automatically with OS X Address Book or with other iSync-compatible applications. Click to enlarge. Gain confidence using step-by-step tutorials in the interactive Tutorial Center. Click to enlarge. Designed from the ground up by Mac engineers, and built for Mac OS X (v 10.5.7, 10.6, or later), QuickBooks for Mac looks and works like a Mac, with familiar printing, preferences, and customization. It operates as you’d expect and looks as clean as the Mac you run it on. QuickBooks for Mac Preferences now has a true Mac look and feel. It’s similar to the System Preferences you’re used to using. Quickly find the setting you need using the built-in search box. Send your QuickBooks data to your Windows-based accountant and open the updated file on your Mac. 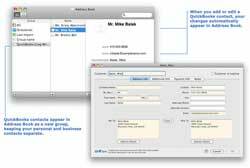 Synchronize contacts automatically with OS X Address Book or with other iSync-compatible applications.16 Update a contact in QuickBooks and Address Book is updated instantly… and vice versa. Prevent painful data loss by backing up your QuickBooks file to MobileMe Choose one-time or ongoing automatic backup. You can restore it at any time. Stay on top of due dates and create reminders to invoice customers in iCal. Any changes you make to the original transaction in QuickBooks will also be reflected in iCal. See how QuickBooks is organized, learn how to complete everyday business tasks, understand how to use new features through simple interactive step-by-step instructions. 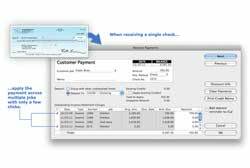 Go from installing QuickBooks for Mac to creating your first invoice faster than ever before. It only takes a few screens to create your company file with the New Company Setup Assistant. And Guide Me helps you quickly become familiar with key tasks (like creating invoices) until you’re ready to start working on your own. While you’re learning, let Live Community connect you with other QuickBooks for Mac users to help you get the answers you need. QuickBooks uses onscreen forms that look like the checks, invoices and sales receipts you use every day. The moment you see them, you’ll know how to use them. The QuickBooks Help feature enables you to simply type a question and quickly receive detailed help, tips and troubleshooting information right within QuickBooks. Easily import data from previous versions of QuickBooks for Mac, QuickBooks for Windows, New User Edition or Quicken for Mac. Intuit offers a variety of free resources to help you find fast answers and get back to business. Get instant answers using QuickBooks in-product Help. Visit the Intuit Community to connect with other users and experts to ask questions and share advice. Or, search or browse the QuickBooks Support Website with thousands of detailed support topics and frequently asked questions. Personalized assistance from QuickBooks experts is also available for a fee.